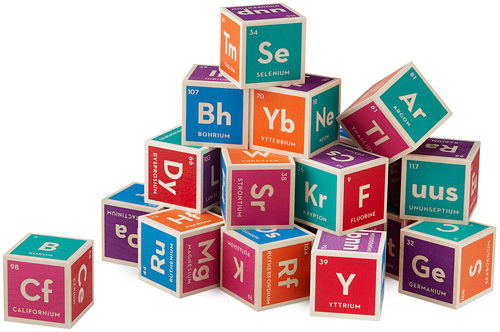 Periodic Table Building Blocks Encourage Subconscious Learning | OhGizmo! If your kid is at the age when they’re even remotely interested in playing with building blocks, I’m pretty sure they’re not even close to being literate yet. But it’s never too early to push them towards academic excellence, so forego those alphabet blocks in favor of this colorful set which features 20 wooden blocks printed with every element of the periodic table. Including their name, atomic number and symbol. While building forts and castles, on a subconscious level they could be on their way to becoming the next Alfred Nobel. The sets are handmade in Grand Rapids, Michigan and are available from UncommonGoods for $40.